The Howard County Public School System has partnered with The Society, Incorporated, Howard County Maryland Chapter to help students strive for academic excellence, promote leadership responsibilities and serve as a resource to support arts education. The partnership was formalized with an official partnership signing on Tuesday, August 21 at the Sheraton Columbia Waterside Restaurant in Columbia, Maryland. Under the terms of the agreement, The Society will provide countywide performance and exhibit opportunities through an Annual Senior Recital showcasing the performances of 12th grade students and an Annual Talent Showcase highlighting the artistic talents of students ages 6-15 through various forms of art. The Society will provide funding for field trips to local performing arts events, musical instruments for students facing economic challenges and college scholarships for students pursuing the performing arts. 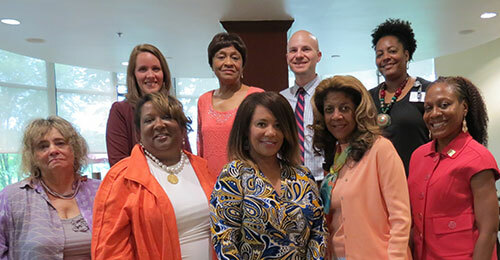 Members of The Society will collaborate with Lake Elkhorn Middle School staff to offer support for the Ladies’ First afterschool program by connecting students to volunteer projects in the community and providing financial assistance for the annual field trip to New York. The Society will also coordinate with the African American Community Roundtable by providing meals for students experiencing food insecurity through the Got Your Back-Pack program at Lake Elkhorn Middle and Cradlerock Elementary Schools. They will also assist with the NAACP of Howard County’s Afro-Academic, Cultural, Technological and Scientific Olympics Program to encourage academic and cultural achievement among high school students. Howard County Board of Education Vice Chairman Mavis Ellis, Lake Elkhorn Middle School Principal Lynnette Moore, Cradlerock Elementary School Principal Jennifer Zinn and HCPSS Pupil Personnel Worker Tracey Williams joined The Society, Incorporated, Howard County Maryland Chapter President Lisa Harbour-Carter, Vice President Sonya Blake-Hamada, Treasurer Althea Bates and Members Judge Leslie Smith Turner and Michele Edinbugh to sign the formal partnership agreement at the August 21 event. The Society, Incorporated, Howard County Maryland Chapter promotes friendship and social exchange among members; functions as a resource for young people in the arts; and promotes educational, civic and cultural experiences within the community.